How Does Low Carb Work? Why is carbohydrate a problem? Why is low carb not working? What are the side effects of a low carb diet? One thing we can be certain of, low-carb diets do work for people with diabetes. They keep HbA1c levels lower than standard low-calorie diets and they’re effective at promoting weight loss. Low-carb diets work on a simple principle but it is still possible to get things wrong so watch out for any mistakes that might be made. Out of the three energy-providing macronutrients (carbohydrate, protein and fat), it is carbohydrate which has the greatest effect in raising blood glucose levels. Protein has a small to moderate effect on blood sugar and fat has the smallest effect. Protein and fat can also raise blood sugar levels but to a much lower extent than carbs. A healthy low-carb diet for diabetes is one that is low in carbohydrate, includes moderate protein and is high in healthy fats. A follow-up benefit of lower and steadier sugar levels is a reduction in hunger. High carbohydrate diets lead to wider swings in blood sugar levels. Both high and low sugar levels can induce hunger so it’s best to stick to a diet that leads to steadier sugar levels. When followed well, low-carb diets are good at keeping you feeling satisfied between meals because a strong intake of vegetables provides the nutrients that the body needs and healthy fats provide energy in a gradual, sustained way. If a low-carb diet is sufficiently low in carbs and not too high in protein, it should induce ketosis; the process in which the body breaks down body fat to use as energy. Because ketosis is the breaking down of body fat, this is therefore highly desirable for people wanting to lose weight. There’s no guaranteed level of carbs under which ketosis will occur because a number of other factors, including protein intake and how much exercise you do, will also play a part. Low-carbohydrate diets that are designed to induce ketosis are given the term ketogenic diets. Ketogenic diets will typically be below 50g of carbohydrate per day. When we eat, the body releases insulin in response to cope with the expected rise in blood sugar. Note that this is not the case for people with type 1 diabetes. Read more about this in our guide on low-carb and weight loss in type 1 diabetes. As we’ve just discussed, carbohydrate raises sugar levels the most and therefore carbs need the most insulin to be released. Insulin is the key player. Too high levels of insulin in the body leads to insulin resistance and then prediabetes followed by type 2 diabetes. The way to improve prediabetes and type 2 diabetes is to reduce insulin resistance and this can be achieved by reducing carbohydrate (and protein if you have a high protein diet). 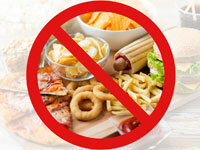 Reducing carb intake reduces the amount of insulin circulating in the body and this works to reduce insulin resistance. The reason many people with type 2 diabetes are overweight is because they are producing very high levels of insulin and a key role of insulin is to store body fat. You’ll see that insulin is therefore responsible for both weight gain and insulin resistance. 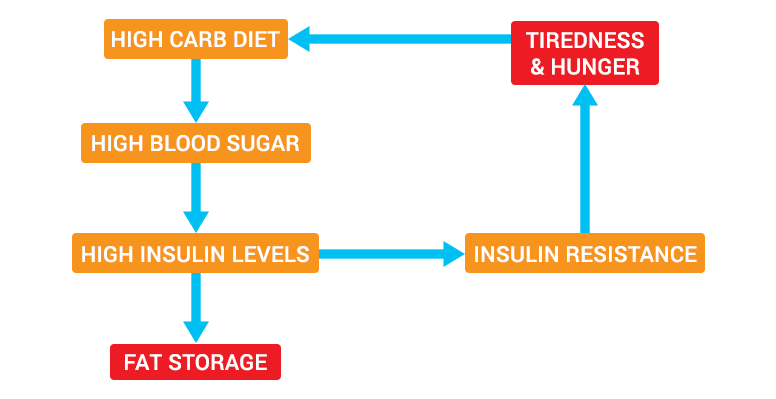 The flow chart indicates how a high carb diet can trigger a chain of events leading to high blood sugar, high insulin requirement and therefore fat storage and weight gain. Key to losing weight is to achieve lower insulin levels through the day and a low-carb diet is one of the most effective ways of doing this. Note that it is still possible to gain weight on a low-carb diet if the diet is high in calories, but this can be greatly minimised by following some core principles. As also noted above, we’ve detailed the principles in our guide to following a healthy low-carb diet. The diet allows you to maintain a normal eating schedule whilst keeping insulin levels and therefore fat storage low. It is important to keep physically active too as this will further help towards lowering sugar levels and burning body fat.